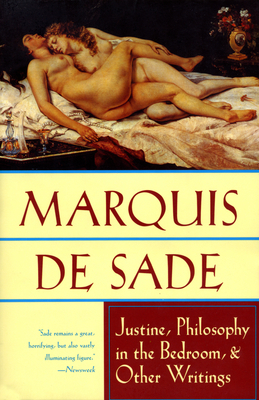 No other writer has so scandalized proper society as the Marquis de Sade, but despite the deliberate destruction of over three-quarters of his work, Sade remains a major figure in the history of ideas. His influence on some of the greatest minds of the last century--from Baudelaire and Swinburne to Nietzsche, Dostoyevsky and Kafka--is indisputable. This volume contains Philosophy in the Bedroom, a major novel that presents the clearest summation of his political philosophy; Eug nie de Franval, a novella widely considered to be a masterpiece of eighteenth-century French literature; and the only authentic and complete American edition of his most famous work, Justine. This literary portrait of Sade is completed by one of his earliest philosophical efforts, Dialogue between a Priest and a Dying Man, a selection of his letters, a fifty-page chronology of his life, two important essays on Sade, and a bibliography of his work.